Thonga Beach Lodge - Mabibi, Lake Sibaya Accommodation. From Johannesburg, drive to Pongola then proceed on the N2 South towards Mkuze. Approximately 45km from Pongola and 10km before Mkuze turn left towards Jozini. On leaving Jozini take a left turn towards the "Coastal Forest Reserve and Kwangwanase" (signposted), ensuring that you are proceeding over the Pongola dam wall. After 45km at a T-junction turn right towards "Kwangwanase". Proceed for another 47 km and at the circle turn right towards "Coastal Forest Reserve". After 15km turn left onto a dirt road marked as "Coastal Forest Reserve". You will see a large government sign indicating directions to Mabibi, Rocktail Bay etc.It is 4.7km along this road to the Coastal Cashew Factory on your right hand side, where you will be collected. There is a brown and white sign indicating Thonga Beach Lodge - non 4 x 4 car parking. The travelling time is approximately 7.5 hours. Upon reaching the Coastal Cashew Factory, two-wheel drive vehicles will park and guests will be transferred to the lodge in Thonga Beach Lodge vehicles (approximately 1 hour). The parking is secured and the entrance guarded. Please note that we have two transfers per day: 12h00 and 15h00. These transfers have to be pre-booked when confirming your stay. Four-wheel drive vehicles can proceed straight to the lodge following the "Coastal Forest Reserve" and "Thonga Beach Lodge" signs. *** Please note that the road from Jozini often has cattle wandering across it and so caution and slower driving speeds are encouraged. Also particularly around the area of Tembe Elephant Park, the road has quite a few potholes. We have been advised that currently there are also some roadworks along this route, which may cause delays. If you would prefer an alternate route, do not turn off at Jozini, but rather continue on further south on the N2 taking the Hluhluwe turn off instead and proceed as per below directions. From Durban, proceed on the N2 North to Hluhluwe. Turn off the N2 towards Hluhluwe, proceeding through the town until you reach the last traffic circle (there will be 4 in total). Turn left towards Mbazwana/Sodwana Bay and proceed for 0.7 km and turn right again towards Sodwana Bay/Mbazwana. Shortly after turning right you will cross over a railway line. Proceed for 87 km bypassing Mbazwana on your right. Proceed straight through the circles following the signs to "Coastal Forest Reserve". Proceed for 33 km after Mbazwana (passing the Mseleni turn-off) turning right onto a dirt road marked as "Coastal Forest Reserve". You will see a large government sign indicating directions to Mabibi, Rocktail Bay etc. It is 4.7km along this road to the Coastal Cashew Factory on your right hand side, where you will be collected. This is sign marked with a brown and white sign. The travelling time is approximately 4.5 hours. Upon reaching the Coastal Cashew Factory, two-wheel drive vehicles will park and guests will be transferred to the lodge in Thonga Beach Lodge vehicles (approximately 1 hour). The parking is secured and the entrance guarded. Please note that we have two transfers per day: 12h00 and 15h00. These transfers have to be pre-booked when confirming your stay. Four-wheel drive vehicles can proceed straight to the lodge following the "Coastal Forest Reserve" and "Thonga Beach Lodge" signs. Once you turn off the tar road it is a poor condition sand road so guests must ensure they do not travel this road after 16h00. Please phone the lodge as you leave Jozini (from the north) or Hluhluwe (from the south) so that we are aware of your whereabouts in time to make any necessary changes to our collection times if you are running late. 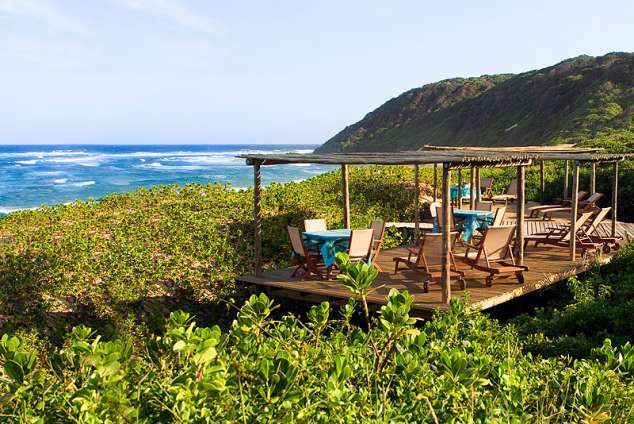 Detail description : Thonga Beach Lodge is set on the pristine shores of the Maputuland Coast, KwaZulu-Natal. This 24 bed luxury lodge is the ideal place to discover one of Africa’s last unspoilt wilderness beaches. It is a magical place of coastal forests, grasslands, bush, shimmering lakes and exquisite sandy beaches. Its crystal clear, warm waters offer South Africa’s best snorkelling and excellent off-shore SCUBA diving and excellent birding opportunities. 40550 page views since 31 Oct, 2007.